Following the passing of her father in Milwaukee, Bridget moved to Illinois to live with her Aunt, and found it difficult to find an employer who would accommodate her needs. Enter Goodwill. Bridget was referred to Goodwill’s Professional Employment Services by the Illinois Department of Rehabilitation. With the help of Goodwill’s Deaf and Hard of Hearing Services, Bridget continued to strengthen her employment skills with Customer Service/Retail Training, where she received classroom instruction and internship experience at Walgreens. 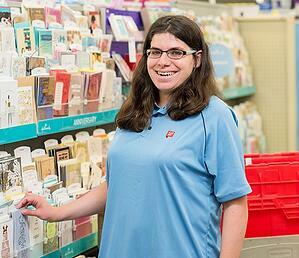 She completed an internship with Walgreens and was hired to work part-time as a Customer Service Associate. Walgreens was impressed with how Bridget proactively approaches customers and asks them if they need help, then using a notepad and pen to communicate with them. Since being directly hired by Walgreens, Bridget has increased not only her hours worked per week but also her cash handling responsibilities, which in turn helps build her self-confidence. Bridget’s high level of commitment to customer service has proved to be a valuable asset to her employer. With the help of Goodwill, Bridget continues to search for her dream job as an Administrative Assistant professional.